We help our customers convert website traffic to qualified leads, helping them drive new business and grow sales. Optimizing your website for mobile browsers is more important than ever. Mobile e-commerce will be responsible for $2.32 trillion (about 67.2 percent) of e-commerce sales by 2021 (HostingFacts). Your navigation and the way you organize your content will have a major impact on user experience, engagement, and ultimately whether or not your customers or prospects will engage with you through your website. 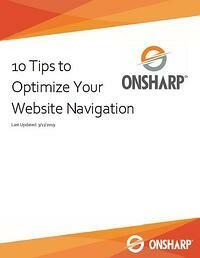 To help you get started down the road of creating an effective website navigation structure, download our 10 Tips to Optimize Your Website Navigation.